Addition involving money, gain skills on shopping and spending money. Addition of numbers in a circle drill - make use of a central number while adding. 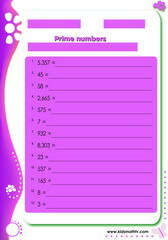 Addition of three numbers activity sheet e.g. 234 + 25 + 88 = ?. Addition of four numbers with or without regrouping e.g. 4 + 6 + 19 = ? Addition of numbers going up to hundreds and thousands e.g. 2,345 + 4,567 = ?. Addition of large numbers up to millions for example 2,456,789 + 1,300,897 = ?. Addition of numbers involving carrying Or regrouping, borrowing across places. Counting following specific patterns activity worksheet - intro to progressions. Finding factors of numbers and making a set - later find common factors of two numbers. Find the lowest common multiple of two numbers; also called LCM. Start adding fractions with this skill. Finding out if numbers are prime or composite is the focus on this worksheet. Learn the rules. Learn to convert between Roman and / or Arabic numerals with this worksheet. Round up numbers activity worksheet - Rounding to nearest whole numbers as required. Represent numbers as a scientific notation - Reverse between standard forms as well. Scientific notation of numbers - learn converting in standard and expanded forms. 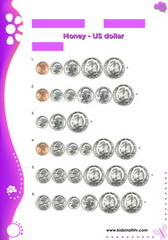 Addition of money values (US $ coins) cents, dime, quarter, nickle. Learn how to evaluate algebraic expressions with problems on this worksheet. Review solving algebra number problems involving finding an unknown variable. Solving and finding unknown variables in algebra equations e.g. solve for 'x' or 'y' in equations. Money & buying - finding how to spend and get a balance - intro for kids. Review Pre algebra skills on addition equations which have a missing unknown value. Pre algebra equations, finding 'x', 'y' variables in equations, making the subject of the formula worksheet. 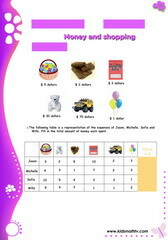 Shopping for items, introductory lesson for kids to learn spending money (US dollars). Add coins dime, cents, nickle, quarter. Worksheet for kids to learn about money. Recognize money values and shop for items. lesson for kids to learn how to shop. Making a shopping list of items and calculating your budget, balance etc. Adding 3 decimal numbers e.g. 4.5 + 5.67 + 1.02 = ?. Addition of decimals, 2.4 + 5.6 = ? Practice with this worksheet. Algebra problems with unknown variables and involving decimal numbers for kids to practice. Comparing two or more decimal numbers activity worksheet for kids in 5th grade. How to convert fractions to decimals, review scales of converting both ways. Learn decimal patterns by understanding progressions in decimal number series. Illustrated decimals exercise with pictures representing decimals values, visual exercise for kids. How to multiply decimals for example 2.34 x 7.89 = ? learn the rules. Round up decimals to the nearest whole numbers or bigger decimal numbers e.g. 4.8 = 5 etc . Subtraction of numbers with decimals involved e.g. 123.56 - 23.56 = ?. Introduction to basic long division worksheet, keep solving and learning more tricks. Dividing 2 by 1 place numbers is a skill 5th graders will learn on this worksheet. Review dividing 3 by 1 digit numbers e.g. 246 divided by 5 = ?. 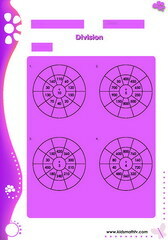 Review division with fun on a circle drill puzzle worksheet. Division of numbers and matching up answers exercise for kids to review. Learn division of whole numbers by fractions with this worksheet. Review division of numbers in a table drill with more fun on this worksheet. Long division with remainders exercise for kids to review advanced skills in 5th grade. Basic long division facts, load of problems to solve and gain skills in. Addition of two fractions e.g. 2/3 + 1/7 = ? 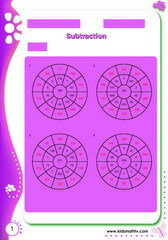 Improve skills on adding fractions. Addition of mixed fractions exercises e.g. 1 1/3 + 3 3/6 = ? Convert mixed fractions and add. Convert fractions to decimals entails dividing to the lowest terms & checking remainders. How to solve division of mixed fractions problems, learn conversions and correct placements. Finding equivalent fractions on problems with missing numerators or denominators. Finding the fraction of some numbers e.g. what is 1/4 of 86 ?. Review multiplication involving mixed fractions e.g. 3 x 4 1/5 = ?. Simplify fractions to the lowest terms, proper and improper fractions involved. Subtraction activities involving fractions, e.g. 2/3 - 1/4 = ?, 5/7 - 8/9 = ?. Find the area of circles worksheet, use pie 3.14, & radius squared. Solve problems needing area of a circle, use the given formula on each worksheet. Find the circumference of circles, distance right round a circle, solve for each figure. Geometry exercises on identifying segments of a line. 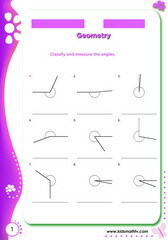 Practical lesson on measuring angles of figures using a protractor, pdf worksheet. Find the perimeter and area of complex shapes / figures, add areas of small sections first. Finding the perimeter and area of L- shaped figures, improve skills in geometry. Find the perimeter and area of rectangles worksheet. Area is length times width. Find the missing side of polygons, vertices with unknown values can be determined. Use the Pythagorean theorem to find the missing side of right angle triangles. 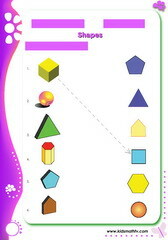 Learn mathematical shapes as required in 5th grade math in this sheet. 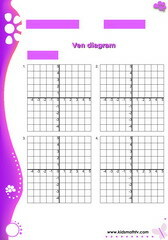 Learn how to relate solid to planar figures with the aid of pictures on this worksheet. 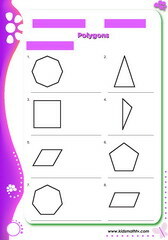 Finding symmetrical lines on shapes or figures worksheet - asymmetry is also a concept. 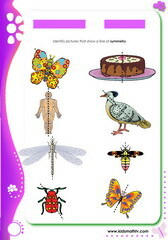 Find symmetry in real life objects with activities on this worksheet. Find symmetry with geometric shapes, rule lines of symmetry with a pencil on this worksheet. 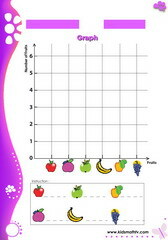 Bar graphs are good for representing information, linear graphs show trends, learnwith this worksheet. Coordinate pairs help to show points in a graph, learn to locate in x, y coordinates with this worksheet. Printable material on representing data on graphs. 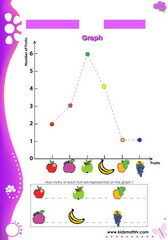 This is a flexible activity on graphs for teachers. 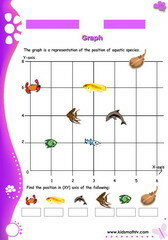 Representation of data on graphs worksheet, learn and gain skills on graphs. Coordinate graphs exercise, locate objects and points in x y coordinates. Understand trends by representing data on Linear graphs and plotting curves. Data representation on tables, learn to represent real life data on tables. Sets & Venn diagrams practice worksheet, learn about statistics and their relationships. Venn diagrams with relationship between sets: universal set, intersection, union, complement. X & Y coordinates, how they help in locating points on a coordinate graph. How to convert scales from millimeters to centimeters, yards to feet, inches etc worksheet pdf. Measurement of angles practical exercise for kids, apply such skills to geometric shapes. Measure rectangle sides and calculate the surface area using formula length times width. Learn to read a thermometer when it gets hot or cold, watch the mercury column rise & fall. Mix operations with equations containing addition, subtraction, division, multiplication & brackets. Multiplication of numbers by 1 digit numbers, for example 24 x 6 = ?, 9 x 7 = ?. Multiplication of numbers by two digit numbers worksheet for reviewing 5th grade skills. Multiply and match up your problem to the answers listed on this worksheet. Multiplication of fractions is tricky but fun too. Example: 1/2 x 2/3 = ? Multiplication of numbers with the fun of a table drill, print and practice with this worksheet. Multiplication involving money values e.g. $ 450 x 68 = ?, learn math skills on money. 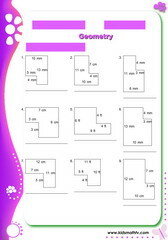 Learn complex patterns in math on this activity worksheet. Start thinking of progressions too. Easy patterns in math, number patterns and progressions, get the formula and start learning. 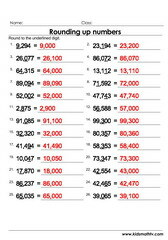 Subtraction of numbers up to hundred thousands e.g. 245,678 - 564,789 = ?. 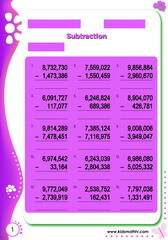 Subtraction of numbers as large as millions; examples are like 2,450,000 - 123,456 = ?. Subtract numbers in a fun way containing a circle drill, puzzle worksheet. Subtraction of numbers on a table drill, improve skills in subtracting on this worksheet. Telling time is a great exercise for kids, distinguishing between a.m. & p.m. makes all the difference. Telling time is a great starting skills for kids, roman numeral clocks are even much challenging and exciting. Learn to tell time after the hour, e.g. what time will it be in three hours from now - pdf worksheet for more practice. 5th grade math worksheets for fifth graders to practice math problems on: addition, money, fractions, ratios, geometry, percentages, division, area of figures, scientific notation, prime numbers, even & odd numbers, composite numbers, probability, pre - algebra & algebra, graphs, metric systems etc. Each worksheet is a careful selection of the best math activities for this grade. Worksheets on this page are meant to serve as math tests for fifth graders or supplementary materials for kid's regular school course. It is also made easy for parents and teachers since each sheet has an answer key attached for easy reference. Being in PDF format and being here 24 hours means you can print then out as many times as possible; a smart thing to do is to make your own collect into an eBook that is always handy.